I'm really excited about this event I get to be apart of with Boston on Wednesday. He's usually in school-but I'm keeping him out for the morning because I really think he'll enjoy it...not to mention so will I. 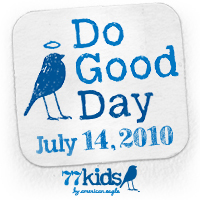 "Seventy-seven fantastic mom bloggers in 11 cities across the country are participating in 77kids Do Good Day on July 14th by doing good in their local communities in pay-it-forward kinds of ways. All in support of the new 77kids by american eagle stores." What my mom blog friends in Philly are doing for the "77kids Do Good Day' is 'Brightening Someone's Day'. Gives me butterflies to think about it, really. Boston and I are making crafts and heading to a senior citizen center to play! I hate to say this...cause I really should embrace it and do it more often... but it's been quite some time since I've been to a senior citizen center. It makes me think of my grandpa. He died in 2003...but he was one sweet old man. That was the last time I had been to a senior center. I think of him and how heloved to put jelly on my nose as a kid. My grandpa was a hoot... For some strange reason-he liked 'making things'. To make a long story short... he once tried to make a houseboat out of styrofoam. (And it wasn't meant to float in the bathtub either!! It was a REAL houseboat! ha) I also remember when we were on vacation..or something-but he bought one of those wooden snakes that move...Remember those? He had it in a paper bag and scared the living daylights out of me. He was quite the jokester. So... with Boston and I going to visit these folks... I'm doing it in honor of my grandpa, Joe. (Yes-I'm Joey, my dad is Joe..and his dad is Joe... you think I was suppose to be a boy? lol) And hopefully Boston, although he is only 2...can learn from this experience. And the sweetness it is. **Another random thought... isn't it amazing how excited older people get when they see babies? I remember when "B" was a baby...and older folks were just enamored over him! Anyway..... I'll let you know how it goes! DISCLAIMER: I am being compensated from 77kids and theMotherHood for this event. 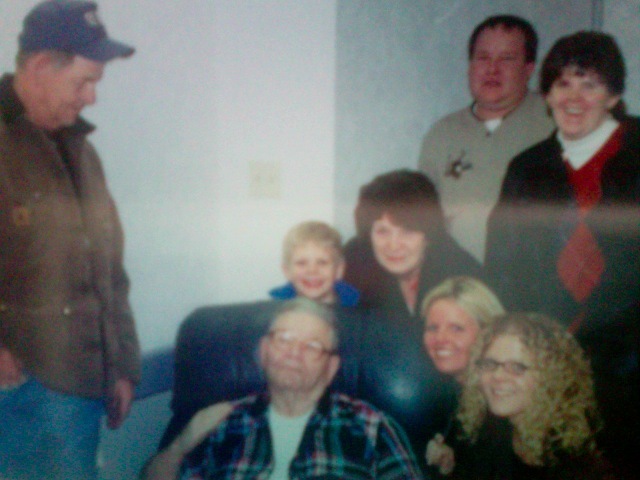 But I do thank them for reminding me of my awesome grandfather & how precious life really is.